I wrote about the change on December 22, 2009, in my blog post How Google May Expand Searches Using Synonyms for Words in Queries, which describes a patent published by Google, Determining query term synonyms within query context, naming Steven Baker as a co-inventor. I also included in my post an example which showed a change in the way that Google highlights query terms to include terms that Google might consider to be “synonyms.” The Official Google Blog provides some information about the change, including the change in highlighting behavior (which wasn’t specifically mentioned in the patent) and my December post digs more deeply into the granted patent. Google’s Matt Cutts also provides some advice for webmasters on what this change might mean and how to address it in More info about synonyms at Google. While in his Late 20s, Benjamin Franklin came up with a list of 13 virtues, which he thought were areas in his life where he could improve. He wrote these virtues down in a book and kept notes on how he was addressing them in his life. He chose a different virtue to focus upon each week, meaning that he would revisit each one 4 times a year. 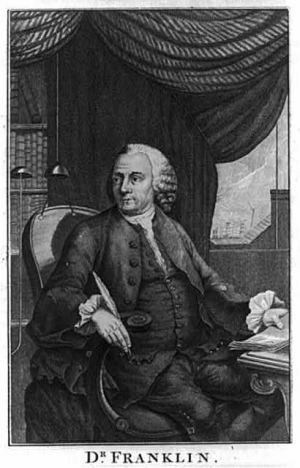 Franklin was one of the first Americans to write about self help and self improvement, and the 13 virtues that he listed appeared frequently in his writings to the public. The virtues that Franklin focused upon were temperance, silence, order, resolution, frugality, industry, sincerity, justice, moderation, cleanliness, tranquility, chastity, and humility. I remember when I first started working on a web site, and recall how much that site changed as I learned more about HTML, graphics, usability, marketing and other topics. Looking back, I’ve been wondering if it would have helped to have a list like Franklin’s, that I could have used to focus my efforts on building, maintaining, and promoting a web site, and that I can use in the future. I originally wrote the following article a couple of years ago for publication at Website Magazine. It presents one way of thinking about the evolution of search and search engines, and I thought it might be a good idea to share it here as well. I’ve added a few very minor updates to the article. Search engines have come a long way since their modest beginnings â€” although you may not have noticed. The major engines such as Google, Yahoo and Bing guard their search secrets closely, so one can never be absolutely certain how they are operating. But they are evolving, and personalization seems to be the wave of the future. Search engines have already developed through two major stages and now may be on the verge of a third generation. The first stage was based simply on matching keywords in documents â€” where the same results were shown to all searchers, regardless of who they were or their original search intentions. The second stage, where we may be now, examines how searchers interact with the search engine to predict their intent. Finally, the third stage will attempt to consider the actual interests of searchers then recommend pages accordingly. At some point in the not distant future, Yahoo search will be replaced with Microsoft’s search service Bing. Exactly how that might impact the other services that Yahoo offers isn’t really clear at this point, but it’s likely that Yahoo will still offer many of the portal services that it provides to its visitors now. Will Yahoo Local and Yahoo Maps be affected? 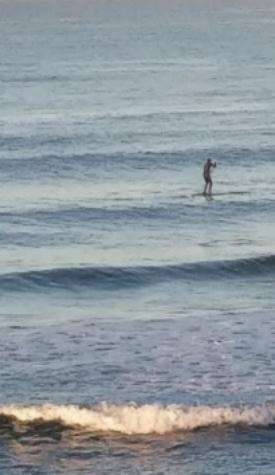 Again, that isn’t really clear. I’ve been keeping an eye out for patent filings from search engines for a while now, and I do still see many published by Yahoo that provide some interesting possibilities, even outside of search. I like old buildings and local history, and learning about how towns and areas have grown and developed, and I put together a little project that might give me a quick glimpse of some of the history of each state in the US. 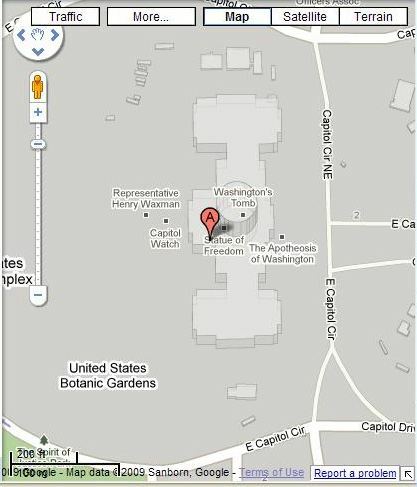 It seemed like an easy task to start with, creating a Google My Maps display of the location of the Capitol Building for each State in the US. I was wrong. It wasn’t easy. One problem was possibly that the place shown in the image below is known as “The Capitol Building” may not have helped. But there were other problems as well. I did manage to create a map of the US Capitol Buildings, though I’m considering it to still be a work in progress. But what I learned making the map confirmed some thoughts about the limitations of search and search engines, and some of the problems I’ve seen with Google Maps and with govenment web sites. You may be familiar with the “I’m Feeling Lucky” button that appears under the search box on Google’s home page. Enter a search query into the search box, and click on the “I’m Feeling Lucky” button, and Google will deliver you to the top result for your query. That button has been on the front of Google since the very early days of the search engine. A patent granted to Google this week would have added an “I’m Feeling Bored” button on Google Calendar. 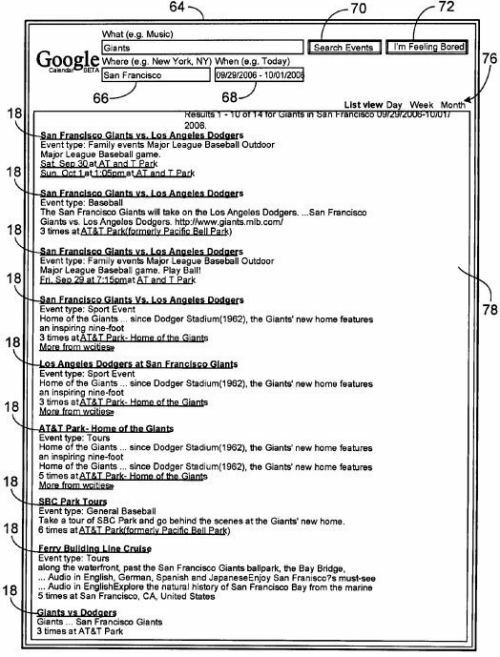 An image from the patent shows the button at the top of a page where you can perform an event search, specifying keywords, a geographical area, and a time period. If you click the button without entering any of that information, the event search might try to find events for you based upon your past query history. Under the process described in the patent, when you search for an event, that event might be one that Google found when crawling the web, in a news article, through a syndicated feed, or from other sources. Events can cover a wide range of activities, including artistic performances, sporting events, lectures, and auctions.